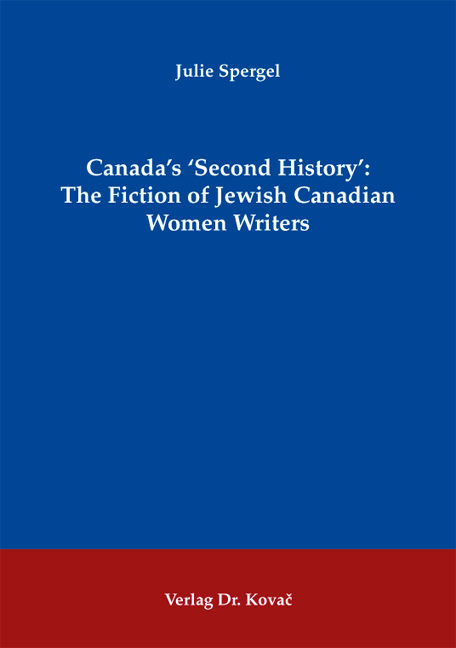 Canada‘s ‘Second History‘: The Fiction of Jewish Canadian Women Writers. Doktorarbeit von Julie Spergel, Verlag Dr. Kovač 2009, 458 S.
In Anne Michaels’s novel „Fugitive Pieces?, seven-year-old Shoah survivor Jakob Beer is reborn, given a „second history? when he emerges out of a Polish bog. As Jakob builds a new life with his adoptive father Athos, the Greek archaeologist who finds him, the two are consumed by a need to uncover the hidden, invisible worlds that lie beneath Greece and Toronto. Their world is one where fragments, ruins, ghosts, missing information, and lost manuscripts call out to be discovered and reconstructed. They learn that by looking to these buried worlds of historythe places of history’s losersa future will eventually be revealed. Michaels’s interest in questions regarding memory, identity, community, and home, as well as of a responsibility to the past, is also of great concern to other Jewish Canadian women writers. Through their common leitmotifs of ghosts, adoptions, and untold stories, these authors look through the overlapping layers of the past in order to right its wrongs by giving silenced voices a chance to speak. This study focuses on the „chronotopic? image of Jewish places such as the shtetl, the European or Canadian city, or the Shoah. Situating their works in „Jewish chronotopes,? these Jewish Canadian women writers hope to demonstrate that memory is moral and that it is through preserving the collective past by participating in the continual revision of historiography that an identity for the present can be constructed. All the chosen novels foreground dialogism, thereby suggesting that identity is not intrinsic nor develops out of a centre. Rather, meanings and identities are multiple and contested because all identityeven that elusive Canadian oneis constituted by the conflict and interaction of multiple perspectives, such as different versions of the past, that refuse a monolithic viewpoint. Canada’s multiculturalism is comparable to the Jewish Diaspora, which is problematised in the novels. They both bear spatial histories that recognise the overlying and competing narratives of a population that cannot be linked through blood. Jewish history is not read in chronotopic writing as a loss and return of a homeland, but as a celebration of the continuing presences of Jewish communities around the world, including, but not restricted to, Israel. Paralleling this line of thought, stories from all over the world that represent or are important to Canada’s varied citizens will also reveal Canada’s spatial history and, accordingly, not only fulfil the goals of multiculturalism, but also amend some of its failings with the acceptance of transnational stories. Like Athos does for Jakob, Canada’s multiculturalism could give the nation a „second history,? one that includes all the histories that are significant to the identities of all its citizens.